APS Tactical & Survival is a Law Enforcement Owned, Family Run Company. We are a supplier of gear for the budget minded adventurer. Whether you're embarking on a tour of duty or preparing for TEOTWAWKI, we have what you need. We specialize in supplying quality and reliable products at affordable prices to keep you safe. It is our goal to provide the best, most current merchandise at a fair price, in an efficient and friendly manner. We want you to be happy with our service so that you will recommend us to others. We appreciate your business and even more -- We appreciate the service you provide to us and others. We cater to: Military, Law Enforcement, Civilians, Hunters, Contractors, Survivalists, Hiking/Campers, and Paintball & Air Soft enthusiasts. We are exclusive dealers for Fox Tactical. Fox is a leading supplier of military, tactical and outdoor gear, constantly striving to meet the needs of this diverse and ever-changing world. 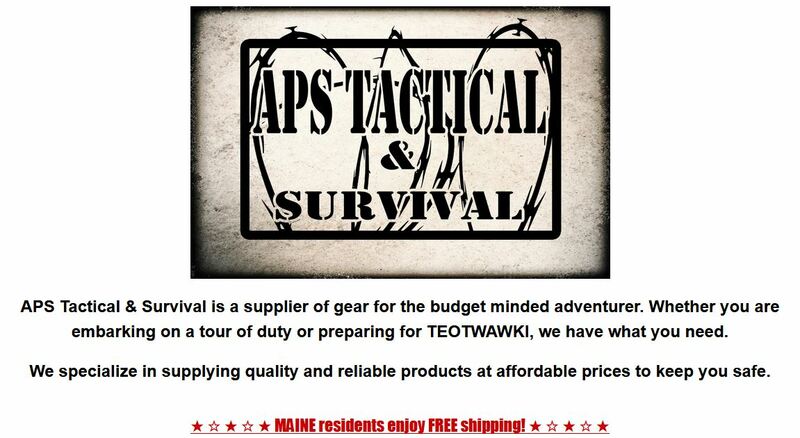 Here at APS Tactical, all gear is field tested before its chosen to be sold. We use what we sell and we sell what we use.